What Do You Want to Know About the 2018 Porsche 718 Cayman GTS? Here’s a confession: I have always liked the Porsche Cayman more than the Porsche 911. I don’t think Porsche wants me to feel this way, since it’s manufactured the 911 to be the iconic golden child of the lineup, but I can’t hide these feelings no more, especially not from behind the wheel of a canary-yellow 2018 Porsche 718 Cayman GTS. I’ve always found the Cayman’s (now the 718) mid-engine silhouette to be much more elegant and shapely over the 911's rear-engined slope. It’s not as practical as the 911 for sure, but I’d let practicality take a back seat for this car, so to speak. In his first drive, our beloved chief test pilot Andrew said that the 718 Cayman GTS is a car that you wear rather than ride in. That is absolutely true. Driving it feels like an extension of your thoughts, it’s that connected with you. 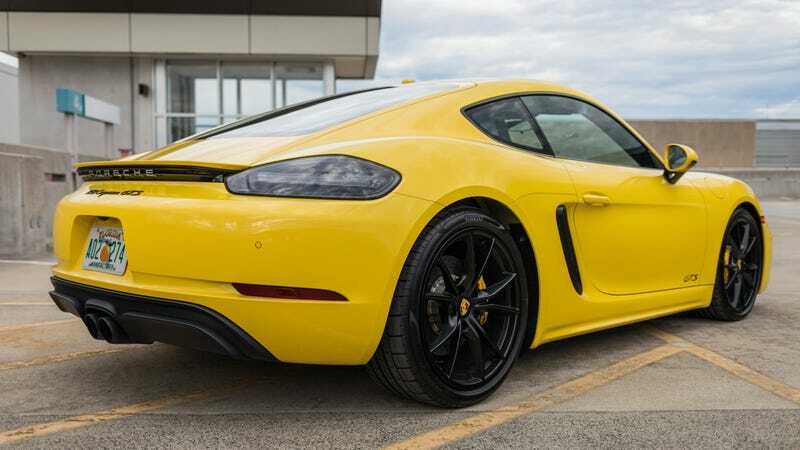 MSRP for the Cayman GTS starts at $79,800, but our loaner has the seven-speed PDK transmission ($3,730) and a carbon-ceramic brake kit for a cool $7,410. That brings the total price up to an eye-watering $96,310. Hey, at least it’s not over $100,000. How Would You Spec Your Porsche 718 Boxster Or Cayman?